On the tail of Old School Renaissance has come another movement—the rise of the fanzine. Although the fanzine—a nonprofessional and nonofficial publication produced by fans of a particular cultural phenomenon, got its start in Science Fiction fandom, in the gaming hobby when it first started with Chess and Diplomacy fanzines before finding fertile ground in the roleplaying hobby in the 1970s. Here these amateurish publications allowed the hobby a public space for two things. First, they were somewhere that the hobby could voice opinions and ideas that lay outside those of a game’s publisher. Second, in the Golden Age of roleplaying when the Dungeon Masters were expected to create their own settings and adventures, they also provided a rough and ready source of support for the game of your choice. Many also served as vehicles for the fanzine editor’s house campaign and thus they showcased how another DM and group played said game. This would often change over time if a fanzine accepted submissions. Initially, fanzines were primarily dedicated to the big three RPGs of the 1970s—Dungeons & Dragons, RuneQuest, and Traveller—but fanzines have appeared dedicated to other RPGs since, some of which helped keep a game popular in the face of no official support. The heyday of the RuneQuest fanzine is long past, but with the forthcoming renaissance in roleplaying games set in Glorantha, it is good to see the return of the fanzine, Hearts in Glorantha, after a hiatus of five years. Published by D101 Games, as a fanzine, Hearts in Glorantha has a focus upon adventures and gameable content which the Game Master can bring to her gaming group. Behind its delightfully and aggressively anatine cover, Hearts in Glorantha Issue 6 comes with four adventures—for HeroQuest Glorantha, RuneQuest Classic, and System-less, a little background, and some memories. It is a good mix with content for both veteran Gloranthaphiles and those new to the setting. It opens with ‘The Awakening’, a system-less adventure by Scott Crowder. In it the adventurers find themselves caught in a dream of the Brown Dragon of Dragon Pass at a point between the Dragonrise and the Dragonkill. Stranded in the lost city of Harna Gamoon amidst an army of Yelmalians they must negotiate their way through the dreamscape to if not change history, then at least set it on another course. This is a scenario that Gloranthaphiles will enjoy as it allows them to both explore a period of Dragon Pass’ history and be its heroes some half a millennium later. The scenario is relatively easy to adapt to the rules of the Game Master’s choice, and would be even simpler to run under HeroQuest Glorantha. Also for devoted Gloranthaphiles, Barry Blatt’s ‘God Forgot’ details the islands of God Forgot in the Holy Country. Adventurers will need good reason to visit these islands as their inhabitants, the Inagreen, are unwelcoming and stand-offish, preferring visitors to stick to Casino Town or Talar’s Hold with its Foreign Quarter. They have good reason for this, having been the victims of crusade in the Second Age and now their primary contact with the outside world is through the mercenaries of their six ‘Legions’, the military-crime families of the Horali caste which squabble with other over who controls what on the islands and thus who can make donations to them (as they are not allowed to trade). Instead of worshipping gods, the Inagreen muse and philosophise about the Logical Laws, and several volumes devoted to such thinking are given in the article. Given the default point of view in Glorantha is that of the theists of Sartar, this is both a weird and an interesting article to read. It may be used as background for player characters or as a strange place for the player characters to visit, but perhaps a scenario hook or two or ideas on how to create Inagreen characters might have helped with either. ‘Light and Death’, by Neil Smith, takes place in the city of Raibanth in the Heartlands of the Lunar Empire. The player characters are members of same League assigned by their patriarch to protect the architect of a new bridge across the Joat river and further strengthen the ties between Old and New Raibanth. They must deal with protestors, a murder, religious fanatics, and illumination in order to prevent the construction of the bridge from being halted. The scenario comes with five pre-generated characters and is relatively short and linear in structure, so it would work well as a convention scenario. One issue with ‘Light and Death’ is that it is written for use with HeroQuest, First Edition rather than HeroQuest, Second Edition or HeroQuest Glorantha, so the Game Master may need to do adaptation to run it under those rulesets. ‘Memories of RuneQuest 2’ is nice callback for long time Gloranthaphiles, especially since RuneQuest Classic has not long been released. It is followed by the ‘Ian Cooper Interview’, a Question & Answer article with the line editor of HeroQuest. An informative piece, it starts with Ian’s gaming history and involvement in writing Glorantha before coming up to date with the Red Cow Saga—The Coming Storm and The Eleven Lights. Throughout the issue are sprinkled four scenario hooks by Newt Newport, such as ‘One of our Fish is Missing’ in which the player characters must find out what has happened to a village’s magic fish and ‘Hunter’s Tower’, a wilderness encounter with a mysterious structure with one door which opens only to lure game animals inside with sweet music. Each of the quartet comes with three options enabling the Game Master to select the reason as to what is going on. Stuart Mousir-Harrison’s ‘Why the Story is the Best’ is a lovely little vignette which pleasingly highlights the difference between knowledge and story by showing us why Lhankor Mhy knows things and Issaries tells us tales. Matt Ryan’s ‘The Lightbringers’ Quest’ is written as an introductory HeroQuest adventure to be run and played in one session players both unfamiliar with setting of Glorantha and the mechanics of HeroQuest. It allows the players to roleplay their way through one of greatest of Glorantha’s myths—that of Orlanth the Storm God descending into the Underworld with his companions to free Yelm the Sun God. This is not a Hero Quest in the usual sense of Glorantha, but a ‘God Quest’ in which the player characters are Petty Gods, who will go on the quest on behalf of the Storm God and petition the Sun God for his atonement and friendship. This is a fantastic—in both senses of the word—introduction to the mythology of Glorantha and enables the players to roleplay both interesting characters and situations, which sadly they are unlikely, at least in the case of the characters, to play again. Now of course, this scenario deviates from canonical Glorantha in the sense that it was the Lightbringers who undertook this quest, not the Petty Gods of the player characters. One option here is to have those Petty Gods become the Lightbringers and so deviate further from canonical Glorantha, but another might be to see this quest as essentially a Hero Quest for the gods, a ‘God Quest’ if you will, enforcing the mythology and history of Glorantha in their quest to become Young Gods rather than Petty Gods. Where ‘The Lightbringers’ Quest’ is problematic is in its use. The players are expected to create their own gods as part of the play through of the scenario and if playing this scenario at home, then this is not an issue. As a convention scenario, which the author suggests it can be ran as, ‘The Lightbringers’ Quest’ is a bit long and overwritten for the traditional four-hour slot they usually run to. Thus, the Game Master may need to do some trimming of the encounters and probably provide some pre-generated gods. 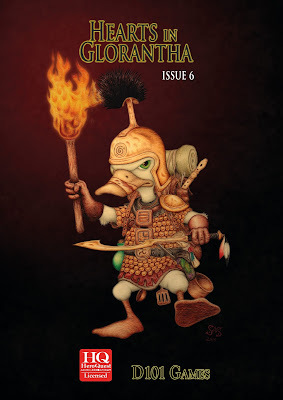 Rounding out Hearts in Glorantha Issue 6 is ‘Duck Hill’. Since there was a Duck on the cover, there had to be a Duck adventure and this scenario by Newt Newport is it. Written for use with RuneQuest Classic, this involves a mad Duck, a Duck day of celebration, and a dungeon. It is short—no pun intended—it is fun, and it is just a bit silly. Physically, Hearts in Glorantha Issue 6 is a clean and tidy book, decently edited and illustrated. As a forty-eight-page A4-size book, it does not feel all that sturdy though. Hearts in Glorantha Issue 6 is a packed with good content and content that can be gamed, whatever flavour of mechanics you prefer. There is enough material in its pages to serve as a jumping on point as well as enough to keep veterans of the setting entertained.